How did you find out about Irvin Duguid? Basically I was introduced to Irvin by someone I knew because I was looking for someone to write with. I started writing some things myself so we got together, I played him the stuff that I’d written and then he played me all the stuff that he’d been writing, which sounded so amazing that I put aside the stuff that I’d been writing. Basically he’d been writing loads of fragments of things and he didn’t know quite what to do with them so I took them away and wrote the lyrics to them and sent them back and then we built the tracks up. I just knew that it was right, the combination of what he was doing and my voice. Were you trying to create a particular sound? I just knew I needed something that would let my voice breathe and was musically beautiful with all the chord changes in it, and just the beauty of it really touched me and I knew that it was going to work between the two of us. It took a while to get off the ground so I had to be very patient with the whole thing but that’s the way it goes sometimes. Sometimes things come together quickly or it can take years. Our influences were Eno, Talk Talk, Kate Bush. Some of the tracks are a bit more direct but we did want to get an overall sound for the album. I know it came later but I was very influenced by Kate Bush’s last album and also Pink Floyd, that all ‘start and finish’ approach. It’s not all like that as each track was individually created and each have their own atmosphere but I’m very happy with the response I’ve had to the tracks from those of my friends who’ve heard them. As you state on your video on your website these will be the first songs you have released where you have written the lyrics since Sunset Gun. Why so long to wait until writing your own lyrics again? A lot of it was circumstance, it’s just the projects that I was involved in didn’t require me to write, for example all the 4AD stuff, and the thing with Craig Armstrong I co-wrote one song (Across the Border) but that was the melody not the lyrics, but again it was all there and I was employed as the voice for it. So I got to the point where I thought I want to be more than just the voice because I know I can write, I’ve done it before, and I got to a creative point where I felt I have to express myself before I die, ultimately and see what I’m capable of, so that’s why. The lyrics I have heard, especially Mimi sound very personal. Would you say that this is your most personal album to date and what do you hope it will communicate to those who hear it? Well Mimi was about my Mum’s death, so a part of it was about me processing my Mum’s death. I knew that I could write about it and it was my way of immortalising her. I’ve had comments from people who know the background to it and it’s helped them with their mother’s death as well. With some of the other songs I experimented by writing about scenarios so apart from Mimi they are about states of mind or certain subject matters , for example solitude, and then just writing them. Also I was really interested in the way Irvin was writing them, because when I first heard fragments of them I was traveling on the tube in London with my headphones on and I was looking around at people and thinking this is music that you can live to so I don’t really want people to know what the lyrics are about as I want them to be whatever people want them to be wherever they may be in their head. I found Irvin’s music so inspiring. I was struggling to write when I was doing it by myself but I took to him some lyrics I done already, and some melodies and he added some chords and we rehearsed and stuff like that. But I found it very hard at the beginning as it was something I hadn’t done before so I was very self-conscious. I’d go to Irving’s house with ideas and sing them to him and it was really hard. But when look back I can see that it was very self-liberating in a personal way as I was so moved by his music and what he was coming up with which is then really what the music became. 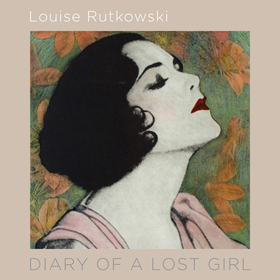 Why have you decided to call the album ‘Diary of a Lost Girl?’ I’m a Louise Brooks fan, and it’s a film by her and I have a big poster of it. I was searching for a title one day and I was writing things down and then found myself staring at the poster and said ‘that’s it there ‘ and fitted with the theme I had in my mind about the album because over the period it was written I was a bit lost with my mother’s death which through up some fundamental questions like ‘what am I doing with my life?’ , ‘where am I going?’ the feeling that the music I was doing was not where it should be, etc. etc. So it kind of fitted the way that I was. The title works. The other link to your early career is that you have recorded the album with Calum Malcolm, who recorded and engineered some of your first demo’s and B sides in the 80’s with Sunset Gun, and you have recorded your new album with Calum. Can you tell me about Calum and what he has brought to the new recording? Working with Calum again has been like Heaven. When I knew it was all working as a writing thing I knew had got to be Calum because I knew I could just hand things over to him, and Irvin's the same, I can hand things over and walk away and leave it and just the quality of what he does and he’s such a nice guy, such a good laugh. He was just the man for the job, there was no question about that. What situation are you in now in relation to the album being ready? We’re at the mixing stage and I’m tinkering with the vocal for something else, just fiddling about with it, but apart from that the things recorded. I’ve been so delighted by the support from fans for the album via Pledge as it’s not on the back of any gig’s, and it’s all happened so quickly. I know it’s early days yet but have you had any thoughts about touring with the new album? I would certainly love to do live stuff and I’ve got ideas for that, how it would look visually. But it would need to be in the right venues, I don’t want to play any old place. Anywhere that’s more like static because I want the music to have space. So I’d rather do less gigs and keep the quality up. Irvin and I have spoken about it and initially it would be just the two of us and that would work though then we would look at cherry picking musicians for special concerts but on the whole it would be just the two of us. I’d like to get the live thing sorted as I have a clear idea of what I want to do. And again I can do what I like, and I will. I don’t have a road manager yet but that’s the next hurdle I need to jump. There is a company in Glasgow and Edinburgh who I’ve been in contact with who might be able to help me, they have contacts in all the arts. As far as tour management goes unless you’ve got something concrete on the table to sell then there’s nothing to discuss, as far as I know. When did you start working on the tracks for this album? Irvin and I felt met in 2006. I hope the next thing I do will be faster, cause now I’m in the zone, but then I felt I needed to start again, the whole feeling and concept and my mother died in 2007 in September so I lost time after that. So it went on for years with getting a wee bit done, then a wee bit more done. Then Irvin was available for about 3 months so we went at it full time and then it was done, so we had the focus to complete it. Tell me about ‘Attitude Is Everything’ and your involvement with the charity? For six years I was an assistant music officer for Arts Council England and part of my job was as disability link officer. There was some research done on disabled people and access to music and it wasn’t all physical about getting into a studio much of it was attitude, not knowing how to deal with them, so in relation to live music there were a lot of disabled people not getting access to tickets . So I was thinking about that and there was an organisation in London working on the same issue, so they had a meeting with us, so we gave them money to start a charter. So they worked directly with promoters and big people like Mean Fiddler. The idea was to deal directly with them so they would get help to see its not a big deal, you don’t have to refurbish your entire catalogue of venues sometimes its just about sticking a bit of tape over there or something like that and educating and training staff to help or for example guide a blind person or someone in a wheel chair. So that was my connection. That was in the early stages but they are still going strong after all this time, six or seven years later. So when it came to do the Pledge thing and linking with a charity they immediately came to mind, so I talked with them and they were delighted. It was nice to be involved again. After Sunset Gun how did you get involved with 4AD, Ivo and This Mortal Coil? My memory of it is rather sketchy, which is rather frustrating as I can’t quite remember. I clearly remember going to meet him but I can’t remember how it came about. I presume some kind of connection was there when we were managed by Elliot, so maybe I was in contact with Elliot because I was big on voices . Also by that time both Dee and me were living in London . He was in the middle of recording Filigree and Shadow when we went to meet with Ivo and it kind of went on from that. How did you feel about being asked to be the sole vocalist for ‘The Hope Blister’? Marvellous, absolutely delighted. I didn’t know I was at first. He sent me some songs in the post and he said can I have a listen to these and demo them . He’d moved to America by this time so we arranged to meet up in a studio in London and as far as I was concerned I was just helping him on demoing stuff , but Ivo being Ivo he had a secret plan. He wasn’t sure I was the voice he wanted so he was trying me out. So he took all the stuff away and thought about it and then contacted me and said I’m going to do this record and this is what I’m going to do. I didn’t need to do the vocals again for the one’s I did in the studio as the demo vocals went straight onto it but I went back into the studio to record the other one’s as we’d only done a few as demo’s. So that’s how it kind of happened. So what were you doing between the 4AD albums? Well, after the album with Craig Armstrong (Kindness of Strangers) went pear shaped I’d really had enough. I was really scared with the whole scenario. So I thought about going to university and studying art, something completely different, as I felt I could deal with this anymore as the deal with Interscope was a bit fraught. So I went to London and took a job with the Arts Council. Through that I learned there was another world apart from commercial music because we were working with World Music, Early Music, new compositions and jazz and improvised music. I looked at all these guys and said to myself, they are all doing it, funding themselves, releasing albums and performing. I felt I hadn’t done enough live stuff and I said I want to do that and I want to be a really good live performer, so I thought if I was down in London it would be a lot easier. So when I arrived I looked for a piano player. I went to a few and then I found Roland, who is the guy on the Six Songs ep, and that was us for the next six years. He’s a fantastic musician. We focussed on live sets and performed in theatres and arts centres as we wanted a captive audience. I felt this really was my best work as I’m not a rock singer. So I spent those years working away at my live skills. And working for the Arts Council they were so supportive, as having someone working for them who was a performing musician was perfect. With the new album do you feel more satisfied with this work than previous releases? It’s a completely different thing. I’m proud of the Sunset Gun work for what it was, I was very proud of the 4AD work, proudish of the Kindness of Stranger’s thing, but this is a whole new thing as I’ve never released something that was my own work. So to me it doesn’t really connect to anything else I’ve done before. This is a goal of mine to do. Are you releasing it yourself? Initially yes, but I’ll be following up some people who are distribution dealers. So once it looks like we have sorted out the fund raising I’ll be speaking to them again. I know it’s easy to say things but they’ve been waiting and it’s been a long process and they are still interested which speaks volumes. I think that’s the best way to go, to maintain control and licensing. So do you have a Polish fanbase? My father was Polish, but I don’t speak Polish, he didn’t teach us. Yes I do have fans in Poland and that’s something that’s happened through facebook. Though I’ve got fan’s all over the world. We’ve had pledge’s from all over, Australia, South America, Middle East and the guy at Pledge says he doesn’t know what the postage costs will be. It’s all been very heartening. This Mortal Coil was popular all over. When I get the royalty payments they come from all over. Is ‘This Mortal Coil’ what most fan’s know you from? Definitely, and then they find out about all my other releases from there. And they genuinely like music so I’ve found that they are the sort of people that I would like to meet. They tell you about other music and share their interests and that’s what’s changed in the industry in that you can be in direct contact with your fanbase. Previously you’d only meet them at concerts but I like the way it’s changed. So how has the Pledge arrangement been going? It’s been agony waiting for the pledges to come through but I shouldn’t worry as I got 79% in four weeks, but to me it’s not just the four weeks it’s been running, it’s the six years that I’ve been making this album. Everythings ready, the recording is done so it’s just the mixing, which is going to be dependent on Calum’s availability.